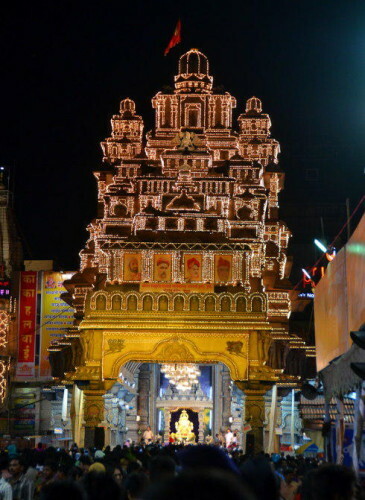 It is that time of the year when the city comes alive in festive fervour. 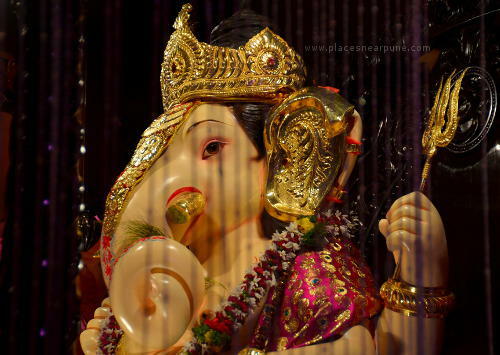 It is Ganesh Chaturthi. 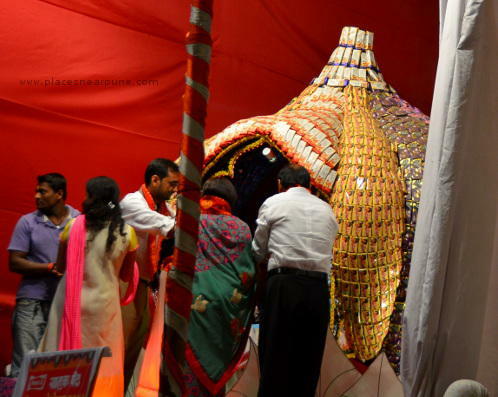 Lord Ganesha becomes the palette for the innovative creations of the hundreds of Mitra Mandals in the city. 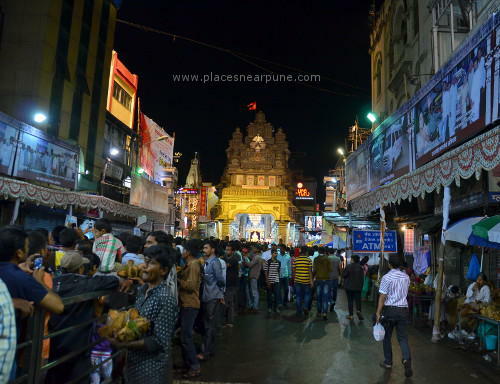 Like last year (See last year’s Ganapati Mandal Photos here), we went for a “Mandal Photo walk” on 5th Sep. 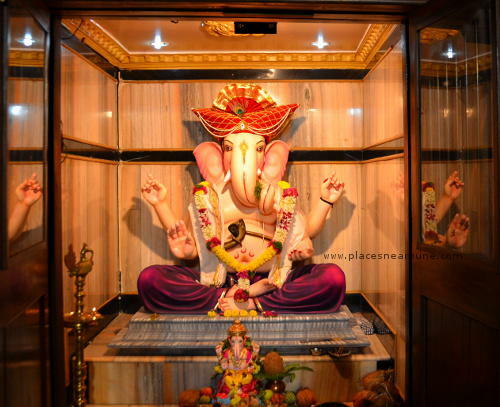 Most of the famous ones are around the dagdusheth halwai Ganapati Temple and Shaniwar Wada. 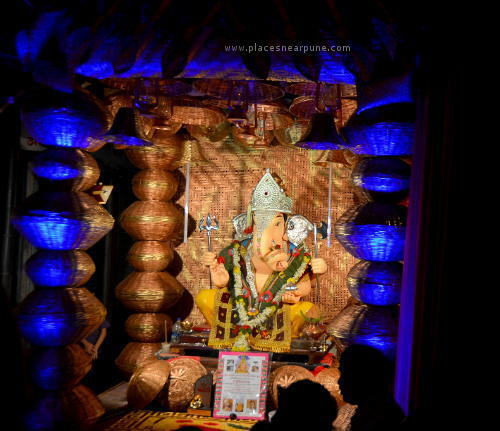 Apart from the 5 main Ganapatis, the smaller ones setup by various mitra mandals are also very interesting to look at. How to go and where to park: The best option is a two-wheeler so that you can keep moving from place to place, park the vehicle. This way, you will also save on the walking time. I don’t usually take my 2-wheeler so far away from my house and that too with a kid, i am not quite comfortable. If you are in a car, the best way is to enter Tilak road, reach the junction at the end of tilak road (the junction between Tilak Road, Paud Road, Laxmi road and few others), turn right into Kumthekar road (the road adjacent to Laxmi road). 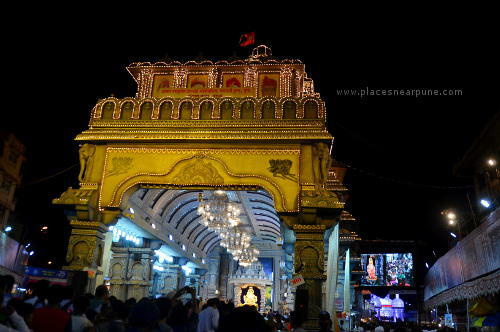 This road is a one-way in the opposite direction to Laxmi raod and during this season, you can park on both sides. Park on this road and start your walking journey. One other benefit of walking: You get the feel of the festival by walking with the crowd. Given below is a map of the 4 km walk we did from around 9 pm to 11.30 pm. 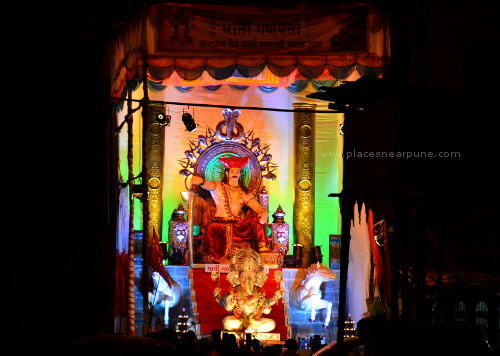 On Tilak road, there is a mandal made of biscuits, Parle G being the most prominent one. Even last year, their mandal was made of biscuits. 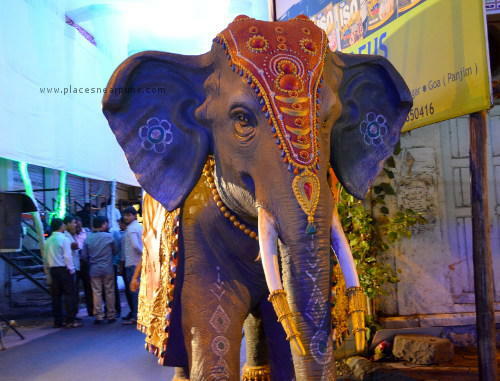 There was another mandal which had two very-realistic elephant statues. 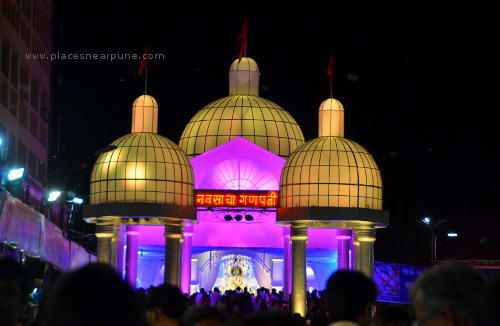 Our first stop was at a mandal on the bylanes of Kumthekar road (the first destination on the map). The Dhol was on and it was amazing. In the crowd, capturing the lights of the palace was very difficult. We then went to laxmi road and covered the entire stretch to go until Tulshibaug. 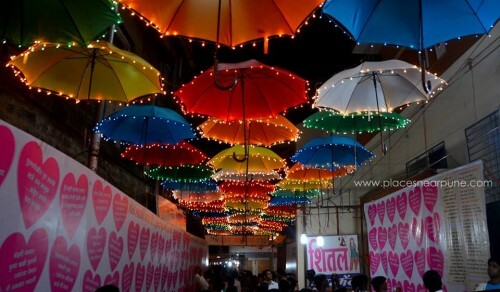 Tulshibaug may be narrow and crowded, but there is a mandal at every corner! 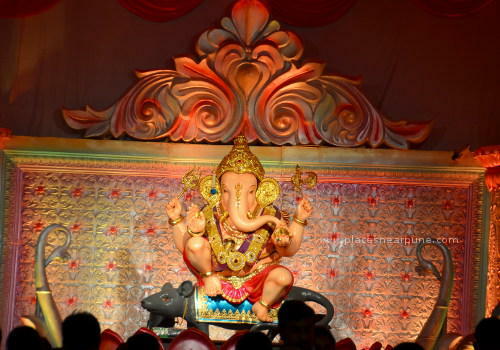 The Tuslhibaug Ganapati is of course the most famous one, but there are many others who put on a good show year after year. 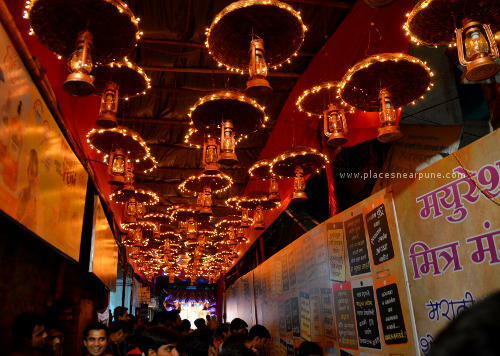 When you enter from the Vishrambaug wada side, there is a narrow lane whose decoration you should not miss. 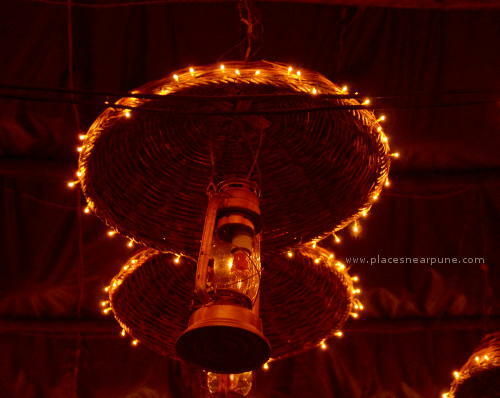 This year, they covered the walkway with lanterns hung from baskets, very creative and beautiful! Last year, they had used umbrellas. Inside the lane is Shivshakti Mitra Mandal who had created replicas of the Kathakali mask and the Thanjavur dancing doll (which actually worked and was cool). 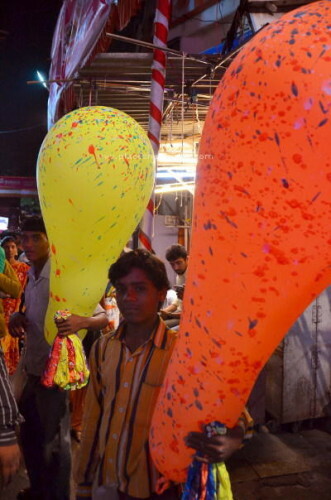 We saw sellers selling HUGE balloons for just 5 bucks a piece. It’s a different story that i have not managed to reach even half the size from the ones i bought before they blew up! Down the lane is Guruji Talim Mandal, which is the third in line among the famous five. 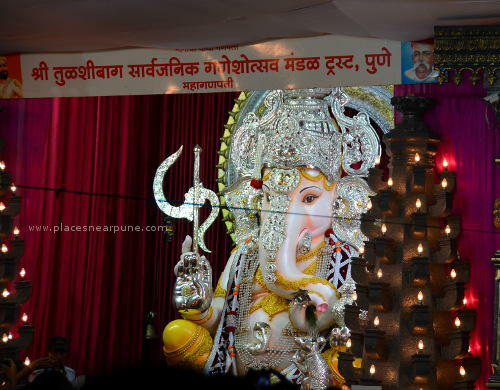 Next was Dagdusheth Halwai Ganapati, the most revered Ganapti in Pune. 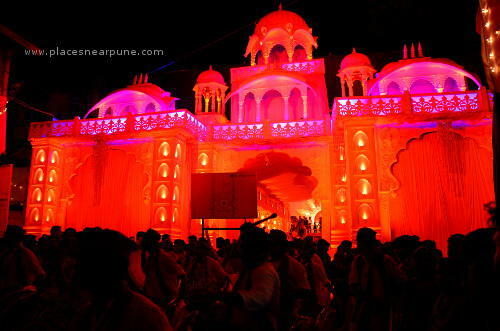 A tip: Everyone tries to enter through Tulshibaug. Don’t do that. You will be diverted by the cops around the temple in a circuitous route (but then you may get to see many other smaller mandals!). 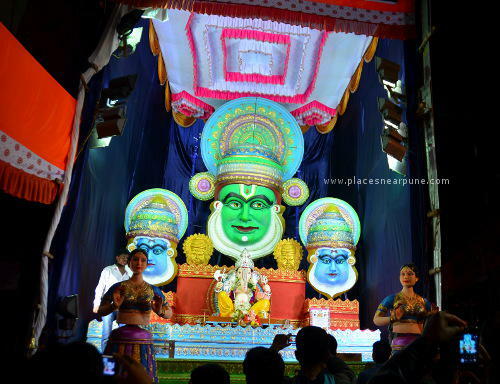 Instead of that retrace through Laxmi road and you can join the queue from the front. This year, they made a small, but significant change. The road was split by a barrier , for those who want to go inside the mandal and those who just wanted to walk by. This helped a lot as we were able to get much closer and then exit through the bylane. 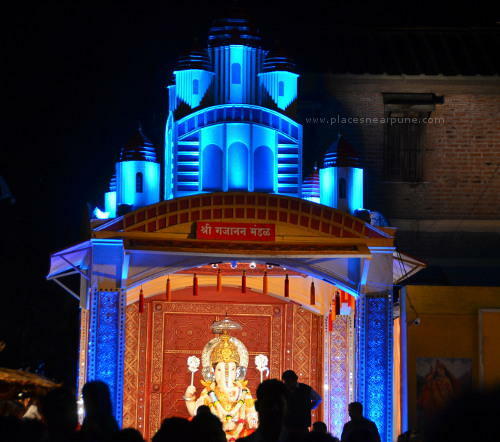 The Navasachya Ganapti near Mahatma Phule Mandai was next. Watching the colours change was beautiful. We then retraced out path through Tulshibaug and went to Tamdi Jogeswari Mandal, the 2nd of the famous five. After that, we proceeded down to Appa Balwant Chowk (ABC Chowk), down NC Kelkar road and back to our car. 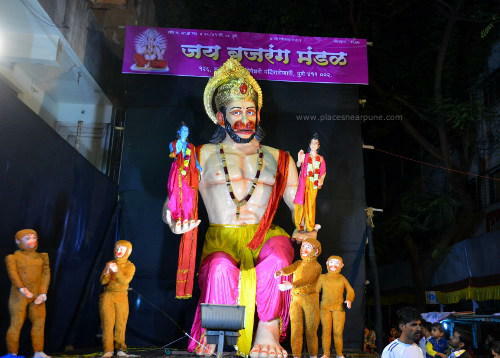 Jai Bajrang Mandal at ABC had a huge Hanuman statue. 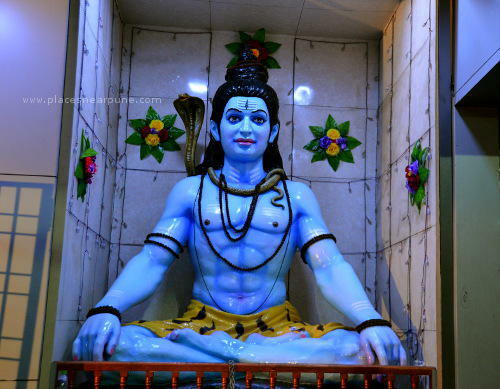 Even Lord Shiva made an appearance in one mandal. It was 4 km round trip, but very enjoyable in the cool evening festive atmosphere. 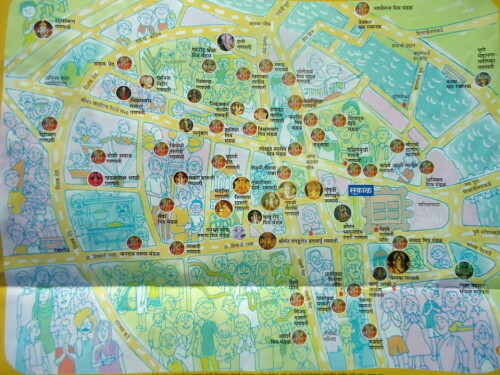 Given below is a map of all the mandals around that area, got this last year. But, mandals are a yearly feature, so this should be a good guide. 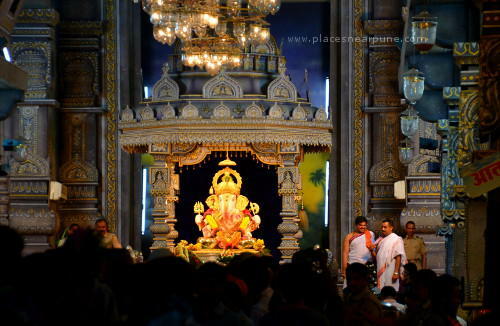 You can also continue on to Shaniwar Wada to see Kasba Ganapati, the number 1 of the famous five.